In the context of its Peace Agreement, Colombia has made significant progress in several recommendations accepted in its last Universal Periodic Review in 2013. The largest challenge today is the implementation of this Agreement, and in overcoming enormous deficits in economic, social, and cultural rights, which disproportionately affect indigenous, Afro-descendent, peasant (campesino), and other populations. The insufficient mobilization of public resources to finance the Agreement’s implementation and other reforms necessary to address grave socioeconomic injustices, as well as the country’s dependence on an unsustainable and inequitable development model, are some of the main obstacles facing the fulfillment of human rights. 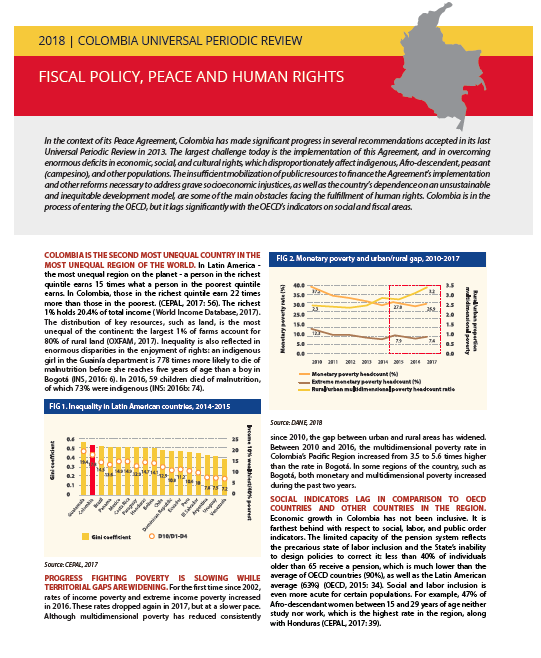 Colombia is in the process of entering the OECD, but it lags significantly with the OECD’s indicators on social and fiscal areas.